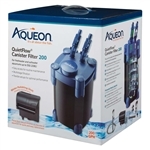 The Aqueon QuietFlow Canister Filter 200 (Up to 55G) is designed for both freshwater and saltwater aquariums. The canister is pre-loaded with biological, chemical and mechanical media to efficiently remove waste and harmful toxins from water. Additional replacement filtration media is also available. Included is a unique hang on the back Water Polishing Unit that makes maintenance quick and easy. Instead of disassembling the canister housing to replace the contents of the media basket, simply replace the carbon cartridge in the Water Polishing Unit. This cuts down on maintenance time and means less frequent changes to the media baskets. For water return you can choose between the included Water Polishing Unit, spray bar and the water director. 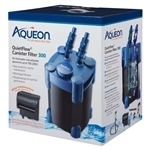 9.055" x 10.826" x 22.24"
The Aqueon QuietFlow Canister Filter 300 (Up to 75G) is designed for both freshwater and saltwater aquariums. The canister is pre-loaded with biological, chemical and mechanical media to efficiently remove waste and harmful toxins from water. Additional replacement filtration media is also available. 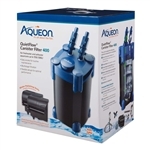 15.25" x 17.25" x 21.25"
The Aqueon QuietFlow Canister Filter 400 (Up to 155G) is designed for both freshwater and saltwater aquariums. The canister is pre-loaded with biological, chemical and mechanical media to efficiently remove waste and harmful toxins from water. Additional replacement filtration media is also available. 14.37" x 14.76" x 20.47"